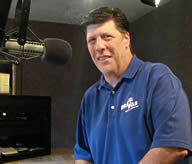 My mainstream radio career began in 1986 but I have been blessed to operate in Christian radio since April 1988! God has shown me incredible grace, favor and mercy over these 22 years! I spent my first ten years in NC at 94.1 WWGL (now KLOVE) and from 1999 here at Virginia’s Positive Hits PER. 1. How has WPER evolved over the last few years? About four years ago our parent company purchased WJYJ 90.5 in Fredericksburg, Virginia. As a result Positive Hits PER covers most of Richmond to the beltway of Washington DC! We like to say that God has strategically placed us between our State Capital and the Nation’s Capital! 2. Has WPER made any changes due to economic situation, been affected in any way? Because of the huge purchase mentioned above we have always had to operate lean even before the change in the economy! We operate with just 5 full time employees and two part timers. This has been our biggest challenge in tough economic times. We are poised for mayor growth with lots of places we want to go and many people who need a touch from Christ. Our small team is working lots of extra hours and wearing lots of hats so we have had to do more than think outside the box. We are working to create a new one! 3. How does WPER connect locally with markets? We have many relationships with organizations helping people in all walks of life! We call them our community impact partners and give them air time to explain their ministry or service. We have also been able to hold annual community block parties that offer free family fun. Last year we hosted a free event that included free food, games and a concert with Francesca Battistelli! Over 5000 showed up for the event! Wish I could connect like this once a month. It’s a delicate mix of art and science! Find out what your listener expects from your station and give it to them in abundance. Make sure you research and test your music with a reliable source. Lower budget stations will have to work harder but nothing is more important than having your music right. I am looking for two key components. What is the listener experience and what is the experience of the 96% who just listen as a promotion unfolds! Question 1 what is the purpose? Promotions with a purpose are about the listener and very little to do with you. You win on the back end with position of their mind. I think the record labels are working extremely hard to understand all aspects of radio’s roll to their success plus the other way around too. I have been thankful to see our industry come together in A unity that’s awesome to watch unfold. I guess this is where I am supposed to do the new technology rant. Truthfully I only think it will help! The one thing that threatens Christian radio the most is the farm of new fresh talent to take the torch and run with it. Many of today’s leaders have been in radio for 20 plus years. The people who have obsessed over radio details are becoming more far and few between. Additionally there are far too few outlets paying the right money to make a long term radio career feasible! There are tons of talents who have been used and abused and tossed to the side by mainstream radio that could help revolutionize this industry on a wider scale. It’s time to invest in the next twenty years! Be a real person that happens to be a believer instead of a believer trying to be a real person! I am delighted to say that the list was short and becoming cliché at one time but now there are dozens of stations who would not take no for an answer! They have my respect and applause! I guess the better question is where I see media in 5 years. It will not look like it does today. While many people are studying the success of facebook and the like I have felt compelled to analyze My Space! Remember them? The site you checked every day. Worked on for hours! A recent survey showed that people forgot they even had an account. What happened? There has got to be some real nuggets for our future and remaining relevant there. May our radio stations never become a My space who was left and forgotten for the next big thing and May our strategies and tactics go beyond Facebook to what is just around the corner!